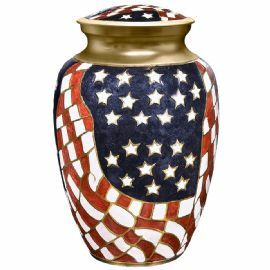 The Old Glory veteran and patriotic cremation urn is crafted from brass in the shape of a classic vase with an American flag design with gold-colored highlights. It has a threaded, top-opening lid. Veteran and patriotic cremation urns celebrate America, and at the same time, they honor and pay tribute to those who have served, or just simply love, their country. These urns feature military or patriotic themes, emblems, and appliqués, and radiate pride for the beloved land of the free, home of the brave. Veteran and patriotic urns can be kept at home, entombed in a cemetery columbarium niche or buried in an earth grave. Please note some cemetery regulations may require that this urn be placed inside of an urn vault prior to earth burial.